T-SQL Challenges has started for some time now and have received really a great response from the community. The endeavor effort of these challenges is to enhance knowledge in SET based query. If you are really expert, you can check your knowledge, if you can’t solve challenge, even; get benefit by looking at solution given by other experts. T-SQL Challenges are really hard to crack so if you are beginners or don’t have really good understanding in SET based theory; you will not be able to solve these challenges. Jacob Sebastian has promised to beginners that he will come up with T-SQL Challenges Beginners so that new SQL Programmer or even .NET programmer can twist their brain and can be a part of these challenges. Name shows that “Beginners”, it doesn’t mean that seasoned programmer can’t take part in it. These challenges for everybody but it suppose to be bit easy than T-SQL Challenges. The main motive of new challenges are, if you are not able to crack T-SQL Challenges, be part of T-SQL Challenges Beginners and develop your mind set with SET based theory so that in future, you will be able to crack T-SQL Challenges. To motivate my programming team, I submitted first solution to this challenge and told my team member to give it a shot, hope many of them have submitted their entries too. 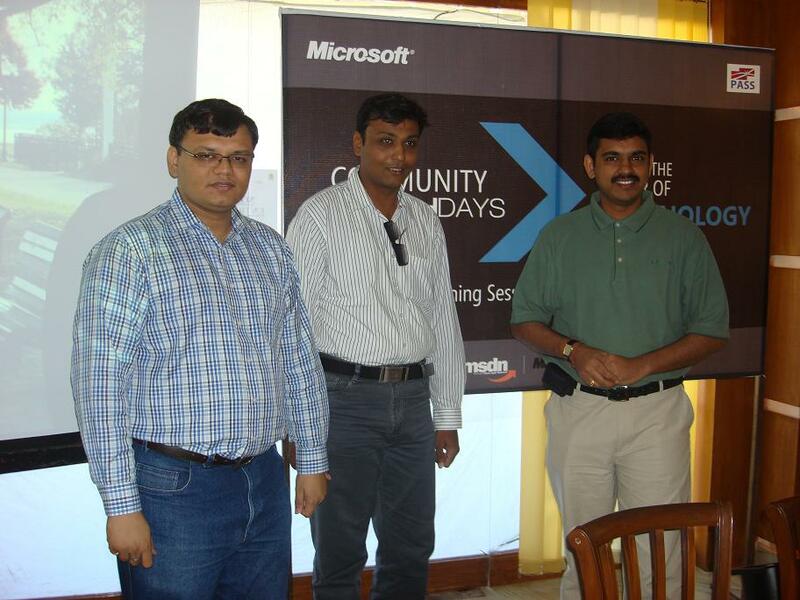 3rd October 2009 was really a great day in the history of Ahmedabad for Microsoft technology. I am really impressed with all speakers whose session I have attended. There was a great warm up appetizer session with superb energy by Mr. Vinod Kumar. 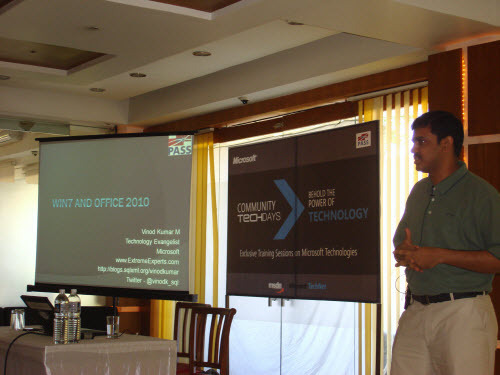 I enjoyed a lot in his Windows 7 and Office 2010 session. 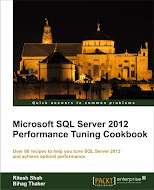 Wanted to have more about SQL Server from Vinod Kumar but Time was a big constraint. 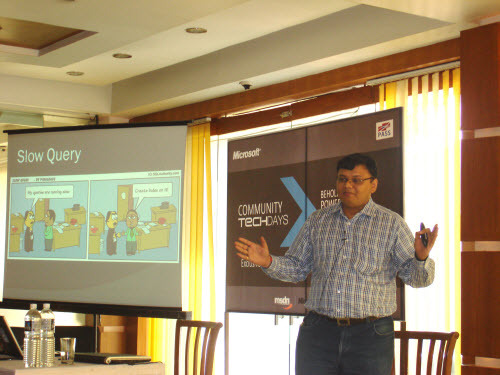 Vinod Kumar’s session was followed up by one of the very well known speaker Mr. Pinal Dave. As always expected, he delivered his session with full energy, joy and knowledge. He really a rock star in the field of SQL Server. Index is really a common term in the world of SQL Server but with his long experience with SQL Server, he share great tips & tricks to handle Index, everybody really enjoyed it. Along with traditional Index and its issues, he explained Filtered Index very deeply which was really new to many people out there. Nobody was feeling drowsy even in after noon, even after having good lunch as Pinal’s session was more interesting than sleeping (though I love to sleep anytime, especially after having good lunch). Now it was a turn of Jacob Sebastian. I am already impressed with this International Speaker out here in Ahmedabad with all of us. His simplicity, his great sense of humor and top of that his smile makes every difficult session and topic, very easy. He used to deliver his depth knowledgeable session with really ease. 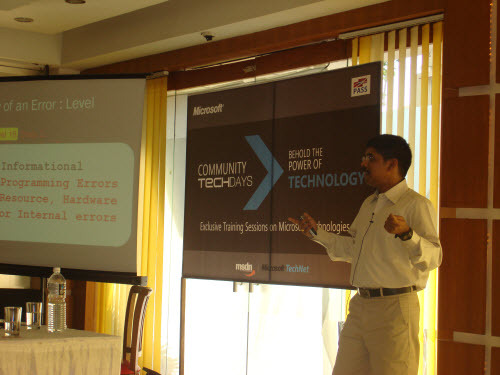 I am really thankful to this technology hero to make aware everybody out there with defensive techniques of SQL Server programming. I myself felt so many times that SQL Server has much more potential, much more capacity to handle set based difficult question but it is really underused. Thanks to Jacob once again to make everybody aware with few tips and tricks. As long as Arrangement concern, It was superb. Big conference hall for seminar, three projectors with big display, having capacity around 250+ but when response was overwhelm, management was powerful enough to immediately accommodate more attendees. Lunch and snacks was also enjoyable, especially “Gulab Jamun”. I love this sweet a lot.